China has a strong street food culture, and the same could be said for one of its most famous cities, Shanghai. But as Shanghai develops more and more, gaining more and more international recognition such as during the Shanghai Expo, the government grows stricter and stricter about policing street food vendors to maintain a certain appearance of the city. 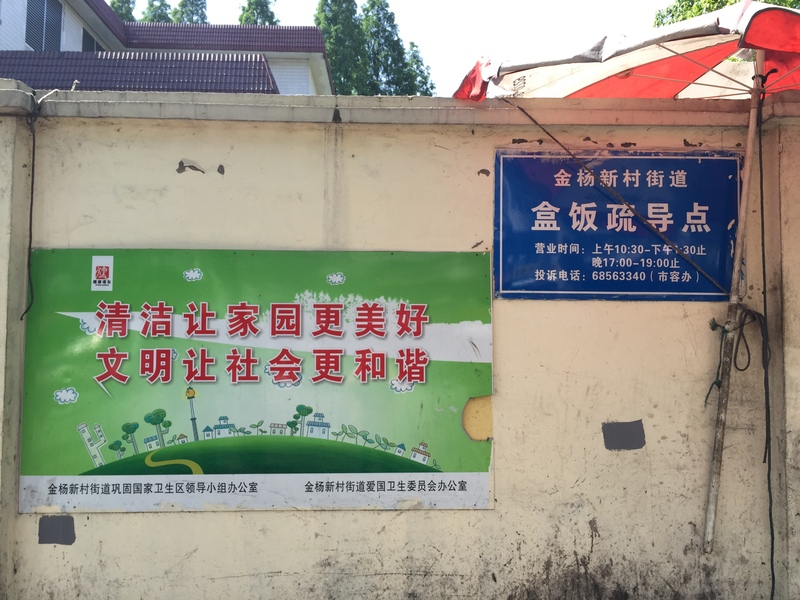 This led to the creation of a special department in the local government, the Chengguan (城管), which literally translates to “city management”. They are outside the police system, but claim that they are managing the street to help the regular city management. And ever since their establishment, they quickly became the biggest “enemy” of street vendors, since street vending without a permit and illegally taking up public space, which should be accessible for everyone, is against the law. Street food vendors, though, don’t like being driven away or having their things being confiscated, especially since selling street food is one of the few ways that migrant workers can earn a livelihood and survive in the city. 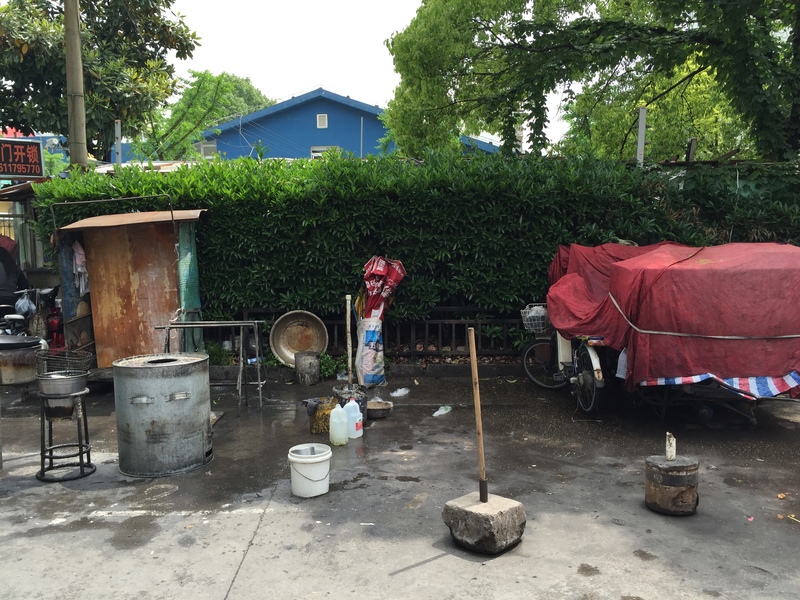 This has led to violent conflicts among street food vendors and chengguan. Another motivation for the government to control street vending is the health issue connected to it. Almost all street vendors sell streetfood without any certificate of sanitation, which may lead to food poisoning for their customers. 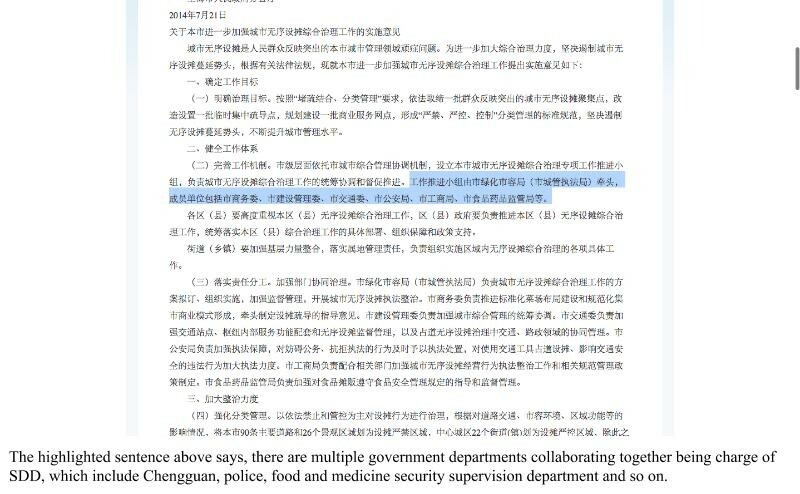 Since stability is most important to the Chinese government, cases of food poisoning from these sellers that will causes problems is not something they want to encounter. However, simply wiping out all the street vendors overnight would not be a solution. To a large extent, street food vendors do provide cheap food to nearby communities, making them some of the most accessible and affordable food sources for people. Whenever Chengguan confiscate the equipment of street vendors, the vendors still go pay a large fee to get the things back and return to selling street food like before. It is all because customers come all the time and there is always a market. Besides, it is actually not the street vendors’ intention to sell food to evade taxation or about selling food where the government think they shouldn’t . It is due to the fact that they are not able to be legally registered into the system. This has to do with the Hukou system, since most of the street vendors in big cities are migrant workers from less developed provinces. It is really hard for them to get a Hukou, which is the identification system in China, and it’s the basic premise for a person to get a proper job, social security, housing, health care and other benefits, not to mention the eligibility to sell street food legally. But due to the extreme unequal social and economic development in different areas in China, there are thousands of migrant workers flooding in the big cities like Beijing and Shanghai each year. So what option do these migrants have when they’re so limited by their different Hukou? There is always street vending. So, street vending isn’t a direct problem that can be regulated by the government easily , but a far more nuanced one that need some compromise between the government and the street vendors in order to somehow satisfy the vendors, government and the people at the same time. The most noted way that people have tried to achieve that is by ShuDaoDian (疏导点). There is no specific definition of what ShuDaoDian (SDD) is online, and it is a highly debated topic among almost all the cities in China, especially those relatively developed cities. And the beginning of SDD also differs among cities, but they all more or less started 10 years ago, due to big events being held in China, such as the Olympic Games. 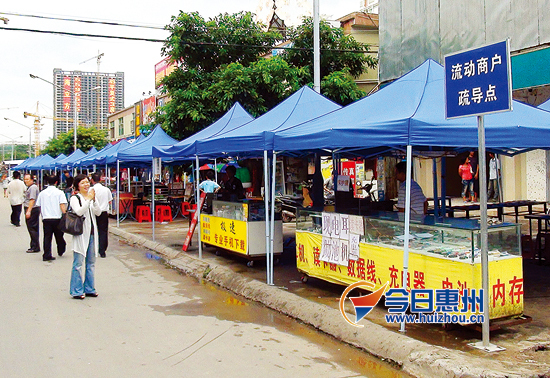 ShuDaoDian is an organized space, usually near neighborhoods or by the street, that is specially allocated for street vendors whose stands were moveable, now to be settled in one place. There, they will not be driven away by Chengguan, as long as they are under the order of government. It is not limited to street vendors who sells food but extended to all of the illegal street vendors without any permits and certificate to do business. But all the SDD have the same two basic purposes, one of which is to be“convenient to people” (便民) and the other is “protect the environment”(环境保护), as you could see almost on every sign beside a SDD. 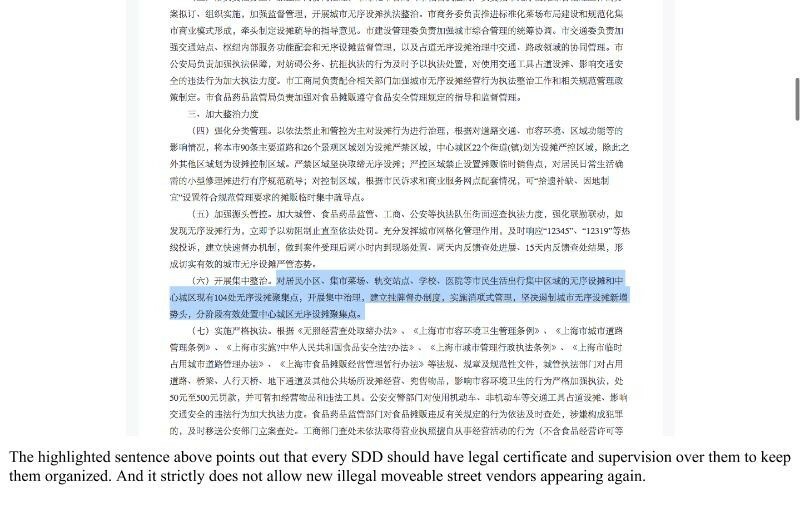 When we chose to specifically look into SDD in Shanghai, we found a policy that the Shanghai local government had made in 2014 to further regulate the proliferation of stands, which only lead to disorder ( 无序设摊综合治理). However, when we looked at this article titled “We should never forget what the initial reason of starting SDD is” (Chinese: 管理便民疏导点应勿忘初衷), we found there are actually a lot of existing problems about SDD. First, SDD, in some places, has already became a tool of getting illegal income for the organizations who get the permit from government to organize the SDD. In some places, vendors need to pay a large amount of money in order to get a spot in a SDD, and they also have to pay a monthly rent to the organizations as well. In some SDD, vendors have to pay 4000 or 5000 RMB per month, and in other places, the entrance fee is 10,000 RMB. We first thought this is simply government corruption, but it turned out that some organizations will charge vendors that make profit out of SDD. However, there is the also possibility of a hidden interest of businessmen and the government (edelweiss1970). Otherwise, how could the organizations get the permit to regulate/organize the SDD, which should be only under the charge of government? Why can the government sell this power of supervision and regulation to others? Is there a deal about power existing? Under such heavy fees, it is very hard for vendors to earn money. Some vendors complain that they could barely reach a balance between the expense and the profit after paying a 1500 RMB rent fee and a 100 RMB cleaning fee. This challenge is another part of SDD, which is giving vendors a proper and legal job to survive in the city (徐一豪). Also, after conducting more research online, it turns out that SDD actually blocks the way and causes a mess, which is the very opposite to what it was meant to be. The literal meaning of ShuDaoDian is “dredging and guiding spot”, which means dredging the street to make it clean and guiding the people to the right place to do business. According to the report of NanDao WanBao (南岛晚报), a newspaper, one of the SDD in Haikou province disturbs the nearby residents with a crowded street and the nasty smell of the trash. And all of it is due to improper regulation, which is mainly because no one is actually in charge of SDD. In this case, it does not only disturb the residents but also make the city appearance worse than before (徐一豪). With all these problems we found about SDD, we started to think about how it’s like in Shanghai. Is it really like what we have heard? We decided to search for news reports or videos of SDD in Shanghai, and we found what is considered as one of the most famous SDD in Shanghai, the SDD in the Changning district, although it sells things instead of food. This video clip shows that everything is strictly regulated, and it is clean and organized at the same time. Vendors find it is better than the situation they had before, where they are under the threat of Chengguan. Customers are also satisfied with it because of the formality of the SDD and its convenience. Is it really a solution to Shanghai street vending problems? There are two Jiedao we are specifically looking into. One is Weifang Jiedao near our school. 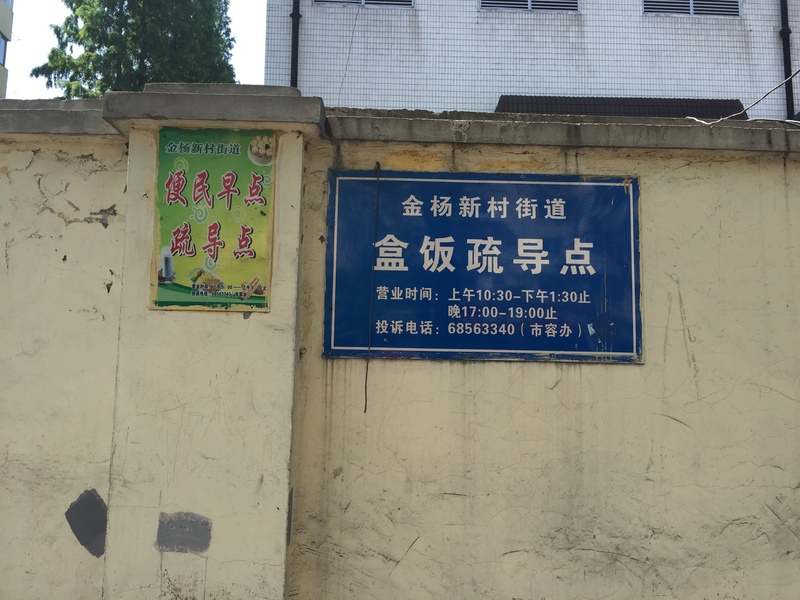 The other is Jinyang Jiedao, near our dorm; the Jiedao is a government institution in charge of the cluster of streets around that area. We wanted to map all SDD in the two Jiedao so we went to talk to the officials in both Jiedao. They were not willing to tell us all of them, but they still told us about 9 SDD and where they are located. So we went there and mapped those SDD. Here is the link of the map on Fulcrum, please check it out here if you are interested in seeing more. As for when SDD first started, according to our interview with the vendors in the Weifang district and also through research, it roughly started 10 years ago, but no one really pay attention to when it exactly started since it was a gradual process and the starting time varies from place to place as well. There has always been strict supervision on SDD whenever there is a big event that is going to happen in Shanghai, though. As mentioned in the mapping video, we chose two SDD to do deeper research on, one from Jinyang and one from Weifang. For this two SDD, we first interview the vendors and then the government department who is in charge of SDD in both areas, in the end, we care about what residents living nearby think about those two SDD. We also had some conversations with people that we didn’t film, because we had meant to inquire only, but the conversations turned out to have some information. First, the Jinyang Jiedao. We went there at night and talked to different vendors, who were not very open to talking. Ziqi: Can I ask you some questions about ShuDaoDian? Ziqi: Why? Isn’t this a ShuDaoDian? Vendor A: Of course not, ShuDaoDian is usually in Puxi. Ziqi: Okay. But do CHENGGUAN come and charge you guys for selling here? Vendor A: No, we do not pay them, and they do not regulate this place. Ziqi: Is this a SHUDAODIAN? Vender B: Go out, and you can see the sign. Ziqi: Do the Chengguan regularly come and check on you? Ziqi: Can I ask you some questions? Vendor C: You can ask the others, why me? Ziqi: Don’t worry, it’s just some easy questions. My classmates once came and asked you some questions, do you remember? Vendor C: I don’t know what are you talking about. Ziqi: Do the Chengguan come and regulate this place? Vendor C: No, they don’t. Ziqi: Where do you get, or rent this from? Vendor C: I’m just a worker, I don’t know any details. Secondly, we had talked to another vendor in the Yuanzhu community, who was much more forthcoming and answered our questions more readily. Vendor: You guys are filming here? It’s not very clean here, not like other ShuDaoDian. Ziqi: Yeah, but your place is actually very clean. So, when does the Chengguan usually come? Ziqi: Really? Do they have the right to regulate this place, though? Vendor: No, because this is the ShuDaoDian until 9:30. But most of the time they just come by and see if there are other vendors who are not supposed to sell food here. Ziqi: Really, so who gave you this spot to sell food? Ziqi: Do you pay them? Vendor: No. We have guan xi 关系 with the JieDao because we live in this community, and so we can sell here. Second, the residents who live around both SDD. Considering the fact that most people are quite not comfortable with having a camera in front of them talking, we used audio recorder instead. And here is the English version of some parts of the interview after we arrange the conversation afterwards. Lingyi: Do you often buy food/breakfast here in this SDD in your neighborhood? Lingyi: Do you find it more convenient to you to have this SDD? Lingyi: Do you feel like the environment here get better after having this SDD? So, after all the research and interview we conducted, we returned to the question: is SDD a solution to the streetfood problem in Shanghai or not? Answering the three smaller questions we used in the interview, for question one, which is trying to discern whether SDD is properly regulated instead of being a method of corruption, it’s a no. There is no entry fee or monthly rent being charged, and cleaning fee in the first SDD is also not being collected later on, so that’s not an opportunity for the government to be corrupt. And as long as the vendors are selling food in the place and the time that is assigned to them by them Jiedao, Chengguan will not interfere. 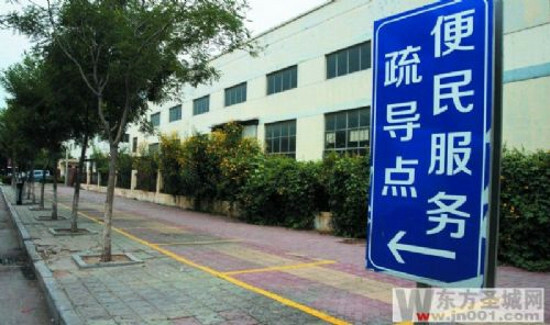 Jiedao seems to be the institution who is in charge of SDD, but actually, once all the places are assigned to the vendors, they will not be in charge of SDD anymore. Except for cleaning the street everyday, there is no one regularly monitoring the SDD. Especially after the Expo in Shanghai passed, no one pays much attention to the SDD, and it is just a part of daily life. People have gotten used to it. So overall SDD is under very loose control from the government. 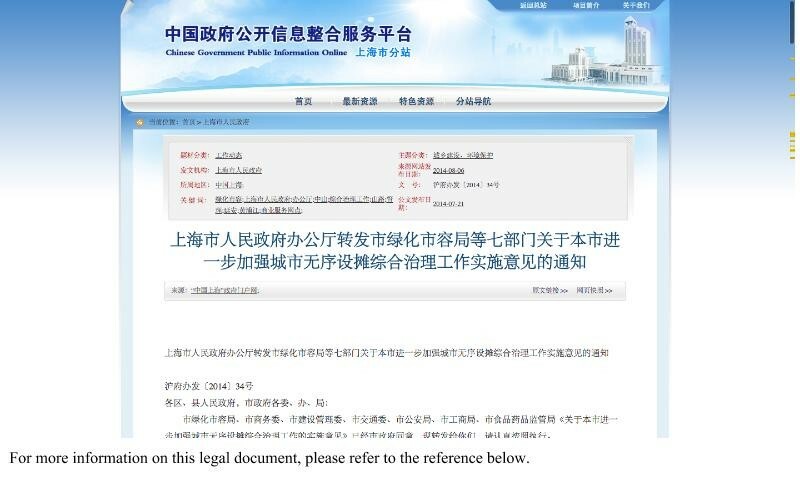 For the second question, we wanted to know whether there is any limitation to vendors getting a permit for a space in a SDD, and whether it can solve the problem of migrant workers who do not have a Shanghai Hukou. 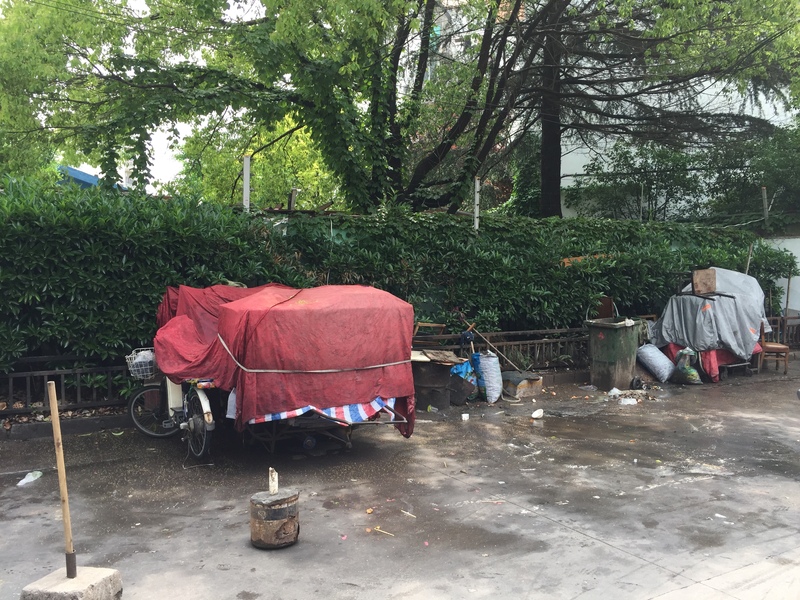 And according to what Jiedao and the vendors explained to us, SDD is set up for people with a low income living around the neighborhood (低保). It does not matter whether the vendor does or does not a Shanghai Hukou. The only limitation is they have to live near the neighborhood, even if they have to borrow money from their friends or relatives to buy a house nearby or rent a house nearby. So it actually rules out a lot of vendors who are not capable of doing so anyway since the housing price is so expensive. Those vendors who we interviewed are the ones who have already lived in this city for a couple of years and have a relatively better economic foundation than those who are new immigrants to this city. Lastly, there’s the question of how convenient SDD is for both vendors and customers, and how good is it for maintaining the environment. 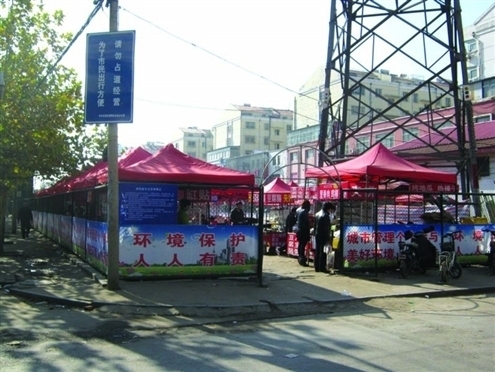 It is a more stable job for vendors and it is a more convenient place for residents to buy food. In the interviewing of vendors and residents in both SDD, we found out almost all the vendors are grateful for what the government has given to them and are happy about not having to be afraid of the Chengguan; it’s a safer and more stable way to earn a living, even if that means they earn less than they did before. For residents, they enjoy how it’s much more convenient for them to buy food, especially those with white collar jobs who do not have the time to cook for themselves or sit down for a proper meal. However, while the street is definitely cleaner and far more orderly, people also think the SDD somehow blocked the way, and the infrastructure is not good enough in order to maintain the street. If there is an emergency, such as heavy rain, then SDD will block the street and cause flooding. And another problem, though, is that street vending is still considered unclean. 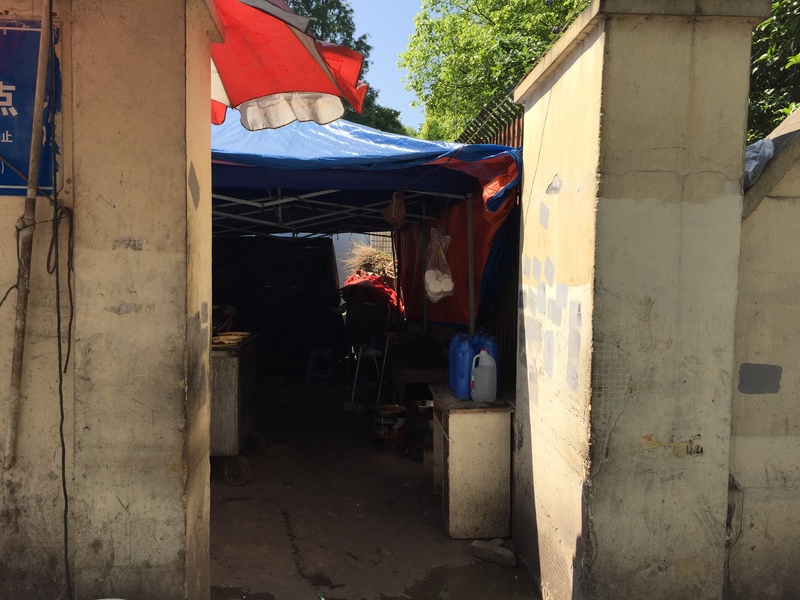 Those in the SDD, while having the certification to sell in it, are not being regulated to maintain cleanliness, and the people we interviewed mentioned their health concerns, saying they preferred to cook their own food. Therefore, it is not necessarily more convenient for all the residents of the area. But all in all, although there are some problems with SDD in Shanghai, it’s not like what the research online has said. It has proven to be an agreeable situation for all parties involved, a far better alternative than the constant conflict between the government and the street vendors, who, despite being constantly defined as “other,” are one of the most vital parts of Shanghai. 东方圣城网. “济宁高新区积极开展城市清洁工程.” Sin Lang Le Ju. 15 Sep. 2014. Web. 12 May 2016. 李婕. “山东济宁城区设置20处便民摊点 疏导流动商贩.” Xinhua News: Shandong. 03 Mar. 2013. Web. 12 May 2016. 文刀. “大亚湾全区拟设10个疏导点安置流动商户(图).” Jin Ri Hui Zhou Wang. 29 Jul. 2011. Web. 12 May 2016. 上海市人民政府. “上海市人民政府办公厅转发市绿化市容局等七部门关于本市进一步加强城市无序设摊综合治理工作实施意见的通知.” Chinese Government Public Information Online. 6 Aug. 2014. Web. 12 May 2016. 方桂琴. “管理便民疏导点应勿忘初衷(图).” Wang Yi News. 20 Mar. 2015. Web. 12 May 2016.
edelweiss1970. “海口便民疏导点，一场官商勾结的寻租游戏.” Tian Ya Community. 28 Feb. 2013. Web. 12 May 2016. 许鲁南. “疏堵结合 自治管理 上海长宁疏导点堪比市场.” Zhu Hai Wang. 24 Nov. 2014. Web. 12 May 2016. 徐一豪. “变味的疏导点如何回归’便民’?” Nandao Wanbao. 10 Mar. 2014. Web. 12 May 2016.